Through four weeks of the 2017 season, seven 8-Man, Division II teams remain undefeated. Defending champion Hanover and 2016 runner-up Dighton are two of those teams that are off to 4-0 starts. Many expected Hanover to be in this spot again as the Wildcats have become the standard of the classification, but Dighton has been more of the exception. The Hornets completed a 12-1 season last fall and reached the classifications final game with only 14 players on their roster. Graduation wasn’t necessarily kind, either. The Hornets graduated four seniors including four-year starter at quarterback in Tyler Lingg and a Kansas Shrine Bowl selection in wide receiver Dylan Foos. Lingg and Foos both earned Kpreps 8M-II All-State honors last season. But, nevertheless, through four weeks the Dighton Hornets remain unbeaten. Although this year’s roster is even smaller with only ten players out. Coach Ken Simon does have the luxury of returning all-state lineman Logan Lingg, but had to replace most of the offensive production. Juniors Blair Hoffman and Dalton Hoffman have done just that. Blair has passed for 319 yards and six touchdowns, while adding a team-leading 451 yards and nine more scores. Meanwhile, Dalton is averaging nearly 8.5 yards per carry and has 321 yards rushing and six touchdowns. With most of the offensive line returning from last season, the Hornets will be another tough out in what is again a loaded District 6 that includes a pair of ranked teams in Otis-Bison (3-1) and Hodgeman County (3-1). The district also features Tribune-Greeley County (3-1) and traditional power Sharon Springs-Wallace County (1-3). Aside from Dighton, Sylvan-Lucas Unified is the only other unbeaten team on the west side of the bracket. The east side includes defending champion Hanover, second-ranked Pike Valley, Mankato-Rock Hills, and a pair of high-scoring teams in District 2. Caldwell led the state in scoring for much of last season, but ended up missing the playoffs after a Week 9 loss to Hutchinson Central Christian. Now, it’s the Central Christian Cougars that lead the state in scoring at 71 points per game. Pleasanton (3-1; 2-0 district) – The Blu-Jays’ only loss came in Week 1 to 8-Man Division I’s undefeated St. Paul Indians. Since the loss, Pleasanton has outscored its three opponents by a combined score of 162-48. Even more impressive, Pleasanton played those three games in a stretch of only eight days. The Blue-Jays haven’t posted a winning record since 2008. Waverly (3-1; 2-0 district) – For the second consecutive season, the Bulldogs dropped a close game to an underdog Southern Coffey Co. squad. But other than that hiccup, last year’s district runner-up has looked strong with lopsided wins over Hartford, Colony-Crest, and Marais des Cygnes Valley. The Bulldogs are led by longtime coach Mike Hevel, who boasts a 178-68 record in his 25th season. Altoona-Midway (1-3; 1-0 district) – The Jets’ 44-28 win over Chetopa in Week 3 snapped a 28-game losing streak that dated back to the 2011 season. Jimmy Willard led Altoona-Midway with 141 rushing yards and two touchdowns in the victory. Colony-Crest (2-2; 1-1 district) – The Lancers are 2-2, but have already suffered a 52-6 loss to Waverly. Colony-Crest was shut out in its two losses, but outscored opponents 132-46 in its two wins. However, the two victories came against teams with a combined 1-7 record. Lebo (0-4; 0-1 district) – It has been a rough start for last year’s district champion which finished 2016 with a 7-3 record. The Wolves had a brutal schedule to start, facing 8-Man Division II’s top-ranked Hanover in Week 1, undefeated Madison in Week 2 and 8-Man Division I’s No. 2 Burlingame in Week 3. And those three losses led into last week’s 60-14 loss to 3-1 Pleasanton. It doesn’t get much easier this week as Lebo will travel to face 3-1 Waverly. Chetopa (0-4; 0-2 district) – The Green Hornets have struggled with numbers since coach Sean Price left the program after the 2014 season. Chetopa boasted a 33-16 in five seasons under Price. Since then, the Hornets are 4-16 with Jaunc Bradshaw as head coach. Chetopa has lost seven consecutive games. Marais des Cygnes Valley (0-4; 0-2 district) – The Trojans are on a seven-game losing streak. New head coach Lewis Whitson came over from Hartford to try and rebuild a program that has had a different coach in each of the last three seasons. Their closest game this season was a 28-point loss to the Kansas Christian Athletic Association’s Veritas Christian Eagles. Caldwell (4-0) – Last season the Blue Jays had the state’s highest scoring offense through four weeks with 250 points. Eventually, Caldwell missed the playoffs thanks to a Week 9 loss to Central Christian in which the Blue Jays were missing several players. Caldwell isn’t as explosive this season, but is still averaging 50.5 points per game. The Blue Jays got a solid victory against Argonia-Attica, 38-20 in Week 2. Corbin Rice has taken over the offense and has had a hand in 626 yards of total offense and 14 touchdowns thus far. Senior Dakota Volavka leads the Blue Jays with 350 rushing yards and has four touchdowns, while Jalen Risley has 265 receiving yards and four scores. Hutchinson Central Christian (4-0) – Ranked for much of the season, Central Christian has been explosive in averaging 71 points per game which leads the state. The Cougars are led by senior quarterback Nate Heneha and lineman J.T. Duree. Garrett Burns and Dawson Urwiller have taken over as the Cougar’s feature backs. Central Christian may not get challenged until a Week 9 trip to Caldwell which should decide the district championship. Norwich (2-2) – Norwich finished 5-4 a season ago which ended a string of four consecutive years finishing with a 2-7 record. The Eagle’s last playoff appearance came in 2008 when they reached the state quarterfinals. Norwich has alternated wins thus far this season, having beaten Stafford (36-8) and Fairfield (54-12). The Eagles have been shut out in their two losses to South Barber and Pratt-Skyline. Norwich will be on the road at Central Christian to begin district play this week. Burrton (1-3) – Burrton snapped a 17-game losing streak with a 66-40 victory over Fairfield to open the season. The Chargers had dropped 54 of their past 55 games. In the opener, Corey Smith tossed five touchdown passes. It was the Chargers’ second win since 2011. Since then, Burrton has been outscored 166-18 in three losses. After reaching the state semifinals in 2002 and 2003, Burrton has posted a 15-103 record. South Haven (1-3) – Once a perennial playoff contender, South Haven has missed the playoffs in each of the past three seasons. Prior to that, the Cardinals reached the postseason for ten consecutive seasons including a state runner-up finish in 2007. This year the Cardinals lone win has come against a struggling Flinthills program. Freshman quarterback Cooper Wolf has thrown four touchdown passes, while junior Chris Arreguin leads the team with 421 rushing yards and five scores. Hartford (0-4) – Hartford was hit hard by graduation after reaching the state quarterfinals a year ago. The Jaguars graduated quarterback Danen Kistner and all-purpose threat Clayton Fowler. The schedule hasn’t done first-year coach Colton Barrett any favors. Hartford’s first four opponents are a combined 13-3. The Jaguars though are giving up too many points on the defensive side of the ball. Hartford’s opponents are averaging 61.5 points per game. Hanover (4-0) – The defending champion Wildcats have dominated through the first four weeks by outscoring their opponents 206-12. Hanover graduated record-setting quarterback Will Bruna last season, but Daiken Stallbaumer is talented replacement. Carter Bruna, Kevin Diederich, and Thomas Atkins are all playmakers on offense, and the line is anchored by 6-5, 300-pound Carlos Emanuel. Wakefield (3-1) – After a nine-year playoff drought, Wakefield returned to the postseason last year with a first-round loss to Pike Valley. The Bombers look to challenge for the second spot out of District 3 against this season. Justin Carver leads the Bomber offense with 475 rushing yards and 10 touchdowns. Skylur Merritt has thrown for 328 yards and four scores. Nathan Jackson has 14 receptions for 262 yards and all four touchdowns, and is one of the classification’s best defensive players. Jackson has 32 tackles, including 4.5 for loss, 2 sacks, and an interception through the first four weeks. Axtell (2-2) – After consecutive state semifinal appearances in 2014 and 2015, Axtell missed the postseason last year with a 4-5 record. The Eagles are 2-2 thus far with blowout wins over Valley Falls and Southern Cloud. Axtell’s losses are KCAA power St. Mary’s Academy and unbeaten St. Paul. The Eagles are led by sophomore quarterback Quinn Buessing who has thrown for 459 yards and nine touchdowns with only two interceptions. Junior Hunter Koch is the leading receiver with 282 yards and seven touchdowns. Frankfort (2-2) – Frankfort is a young but promising football team this season. The Wildcats have only two seniors, and statistically many of their leaders are freshmen and sophomores. Sophomore Garret Dalinghaus leads the team in rushing and has been one of the classification’s top tacklers thus far this season. His classmates Trey Estes and Brian Joseph have also shine on the defensive side of the ball. Frankfort will challenge for the second playoff spot, but tough road trips to Axtell and Wakefield to begin district play may be difficult to overcome for such a young group. Wetmore (2-2) – The Cardinals picked up the program’s first victory in more than 30 years when they beat Valley Falls 60-18 back in Week 1. Wetmore followed that up with a 62-36 victory over Onaga before falling to Linn and Madison. Rick Schnacker’s group is led on offense by Kyler Vance and Joel Hutfles. Vance leads the team with 416 rushing yards and six touchdowns, while Hutfles has added 378 yards and four scores. Hutfles has also passed for 164 yards and six touchdowns. Blue Valley Randolph (1-3) – The Rams have showed signs of life the past couple of o weeks in beating Tescott 38-34 and falling 22-14 in a close loss to Southern Cloud. Junior Lane Peter leads Blue Valley Randolph with 288 yards rushing and four touchdowns. The Rams last trip to the postseason came back in 2006. Mankato-Rock Hills (4-0) – The Grizzlies, which narrowly missed the playoffs last year, has rolled through their first month with all victories by the 45-point margin. Junior quarterback Dereck Gillett has completed 19 of 28 passes for 280 yards with a 5/0 TD/INT ratio. Junior Zane Colson and sophomore Rylee Whelchel have combined for 21 rushing scores. Pike Valley (4-0) – Pike Valley earned a marquee home victory last Friday with a 30-28 win against Osborne and ended the Bulldogs’ 16-game winning streak. The Panthers, 22-5 since the start of the ’15 season, won the district title last year. Senior quarterback Davante Hammer has thrown for 479 yards with a 9/2 TD/INT ratio. Senior running back Lane Peters has rushed 67 times for 430 yards and nine scores. Senior Cole Strickler leads the defense with 43 stops and six TFLs. Beloit St. John’s-Tipton (2-2) – The Bluejays graduated a large senior class off a top-five team that reached the playoffs last season. BSJT carries a 16-player roster with three seniors, including Ty Brummer. He has led BSJT with 80 carries for 406 yards and six scores. The Blujays have struggled with nine turnovers. BSJT has recorded five straight winning seasons. Linn (2-2) – Led by junior Joseph Trumble, Linn has four players between 113 and 295 yards. He has recorded 32 carries and four rushing scores, also a team-high. Linn’s two losses have come against Clifton-Clyde and defending state champion Hanover, both which are 4-0. The Bulldogs’ only playoff appearance since ’01 came in ’11. Southern Cloud (2-2) – The Warriors ended a 22-game losing streak with a 92-48 victory against Wilson in Week 3. Then, Southern Cloud promptly defeated Blue Valley-Randolph, 22-14, at home in Week 4. Junior Carson Bellows has 53 carries for 313 yards and seven scores. Tescott (0-4) – The Trojans have permitted 48, 68, 38 and 46 points in its four losses. Tescott played Blue Valley-Randolph close in a 38-34 defeat in Week 3. Last season, Tescott won a pair of contests against Blue Valley-Randolph and Southern Cloud. Sylvan-Lucas Unified (4-0) – The Mustangs have won each game by at least 32 points and have outscored teams, 222-42. Sylvan-Lucas stands third in scoring offense in the classification. Last season, the Mustangs permitted 110 points in the first four contests. The Mustangs, which narrowly missed the playoffs last year, are 10-3 in its last 13 games. Northern Valley (2-2) – Northern Valley has not made the playoffs since 2005 but has generally posted strong records, with at least four victories in five of the past six seasons. The Huskies, known for high-scoring games the last several years, has tallied 144 points but permitted 148. Senior Caden Kindernecht is on pace for another big year with 26 of 57 passing for 353 yards with a 5/4 TD/INT ratio. He has rushed 69 times for 466 yards and four scores. Wilson (1-3) – The Dragons, 6-2 and 5-4 the previous two seasons, lost their first three games before a 46-12 home win against Tescott in Week 4. The Tescott victory opens a stretch of three straight home games that includes Thunder Ridge and Northern Valley the next two weeks. Wilson started the season with three straight road games. Lakeside-Downs (0-4) – Lakeside, the ‘15 district runner-up, has struggled against a brutal slate that ranks as the No. 3 hardest strength of schedule in the classification. The Knights list just 13 players on the roster, including three seniors. Senior Drew Cunningham has one rushing and one receiving score to lead the team. Stockton (0-4) – The Tigers won the district last year for the first playoff appearance since 2002. However, Stockton has struggled, especially defensively with 40, 64, 56 and 62 points permitted. The Tigers lost to WaKeeney-Trego, 40-34, in a season-opening overtime contest. Last year, Stockton opened 0-5 before four straight victories for the district title. Junior quarterback Brady Beougher has completed 27 of 46 passes for 247 yards with a 3/2 TD/INT ratio. He has rushed 58 times for 325 yards and all six of the team’s rushing touchdowns. Thunder Ridge (0-4) – Thunder Ridge has permitted 60, 62, 46 and 62 points in the first month. The Longhorns’ opponents are a combined 15-1 for the second-hardest SOS in the classification. Thunder Ridge has dropped 19 straight contests. Dighton (4-0) – The Hornets graduated its all-state tandem of quarterback Tyler Lingg and receiver Dylan Foos from their 12-1 squad that earned state runner-up to Hanover. Dighton has continued to play well. Junior quarterback Blair Hoffman has completed 21 of 36 passes for 319 yards with a 6/2 TD/INT ratio. He has rushed 56 times for 421 yards and nine scores. Junior Dalton Hoffman has 38 carries for 321 yards and six TDs. Dighton has outscored teams, 187-34, and is tied for second in the classification in scoring defense. Hodgeman County (3-1) – The Longhorns have stayed in the same top-five throughout the first month with a loss to 4-0 Spearville and a win against 3-1 South Central. Senior Jacob Salmans, a four-year starter, has completed 23 of 35 passes for 390 yards with a 3/1 TD/INT ratio. He and his brother, sophomore Eli, have combined for 60 rushes for 360 yards and eight rushing scores. Otis-Bison (3-1) – The Cougars tallied one of Division II’s best victories with a 22-20 home win against Victoria in Week 4. Otis-Bison gets Wallace County, Dighton and Hodgeman County all at home this fall. The Cougars went 1-2 versus those three teams in ‘16 and narrowly missed the playoffs. Junior quarterback Anton Foust has completed 63 percent of his passes for 284 yards with a 5/0 TD/INT ratio. He and senior Blake Bahr have combined for 84 rushes for 573 yards and 10 scores. Tribune-Greeley Co. (3-1) – Greeley County has started 3-1 for the second straight fall. Last year, the Jackrabbits went 0-5 in district play. Greeley County has not recorded a winning season since 2010. Sharon Springs-Wallace Co. (1-3) – The Wildcats have made the playoffs every year since 2006. Wallace County made some uncharacteristic turnovers and struggled with low numbers in three straight losses to Division I’s St. Francis, Atwood and Hoxie to open 2017. Wallace County defeated WaKeeney-Trego, 42-14, at home in Week 4. Triplains-Brewster (0-4) – The Titans have struggled with 58, 56 and 48 points permitted in the first three weeks. T-B lost, 34-22, versus Wichita County in Week 4, the second of three straight home contests. The Titans are 1-12 since the start of 2016. Pretty Prairie (3-1) — Pretty Prairie has posted three straight winning seasons, though no playoff berths in that span. Pretty Prairie lost, 90-38, to Hutchinson Central Christian to start the season, but then scored 54, 49 and 68 points in its next three contests. Overall, the Bulldogs have tallied 208 points, fourth-best in the classification. Junior Samuel Livingston has 57 carries for 514 yards and 12 scores with three 100-yard performances. South Barber (3-1) — South Barber has outscored teams, 174-34, and is tied for second in the classification in scoring defense. South Barber, which won the district and a playoff game last season, averages 119 passing and 174 rushing a contest. Sophomore Trevor Rooks has completed 60 percent of his passes for 476 yards with a 9/1 TD/INT ratio. Junior Neal Gugelmeyer has 36 carries for 300 yards and five rushing scores and 36 tackles. Chase (1-3) – Chase beat Wilson, 32-18, at home in Week 2 before big losses to Rock Hills and Sylvan-Lucas, teams that remain undefeated. The Kats, which collected a playoff win last season at Ingalls, have made the playoffs six of the past seven years, including three in a row. Stafford (1-3) – Stafford defeated Burrton, 46-0, at home in Week 2. The Trojans lost in Weeks 1 and 4 by 28 and 24 points in road games versus Norwich and Oxford. The Burrton win ended an eight-game losing skid. Bucklin (0-3) - The Red Aces had a Week 4 bye after three losses by the 45-point margin. Bucklin finished 2-7 in 2016. The Red Aces’ lone playoff appearance since ’99 came in ’06. Ashland (0-4) – Ashland has struggled with just eight points scored this year. The Bluejays finished 4-5 last year with three straight losses to end the year. Ingalls (2-2) — Ingalls, the district champion last year, has posted L-W-L-W through the first month. 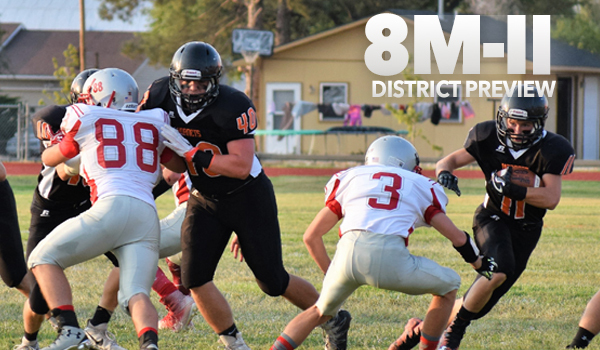 The Bulldogs beat Bucklin (54-0) in Week 2 and Kiowa County (68-34) in Week 4. Ingalls has reached the playoffs four straight seasons. Moscow (0-3-1) – First-year coach Tayler Stull, a former La Crosse High and Bethany College standout, has had a unique first month. Moscow tied the opener against Balko, Okla. and then hasn’t played at home since. In Week 3, the Wildcats had to forfeit at Tyrone (Okla.). This week will mark the fourth straight scheduled road game. Deerfield (0-4) – Deerfield has struggled with losses by scores of 57-6, 74-0, 74-0, and 70-0. The Spartans have lost 15 straight contests. Minneola (0-4) — Minneola took a big loss when standout running back Tristan Haynes transferred to Meade and is now the Buffs’ starting quarterback. The Wildcats have four playoff showings in the last five years. Minneola has scored just 22 points this season. Rolla (0-4) – Rolla started with three straight road contests. The Pirates have scored 40 points and permitted 50, 42, 48 and 52 points. Rolla has lost seven straight contests.